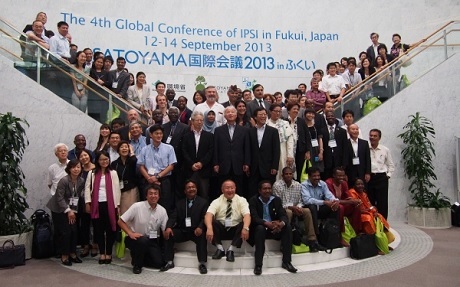 The International Partnership for the Satoyama Initiative (IPSI), for which the UNU Institute of Advanced Studies (UNU-IAS) serves as the Secretariat, held its Fourth Global Conference in Fukui, Japan, from 12–14 September 2013. The theme of the conference was “The Way Forward: Implementing the IPSI Strategy for the Benefit of Biodiversity and Human Well-being”. At the steering committee meeting held prior to conference, 8 new members were approved, bringing the IPSI membership to 155 organizations. The conference began with an excursion on 12 September, with 64 participants who were introduced to the conservation and promotion efforts of Echizen City’s Shirayama District (which is working to bring back the wild oriental stork) and the Mikatagoko Lake District (which is attempting to restore freshwater clam habitats and secure fishways for fish to freely move to and from the lake and the paddy fields). The IPSI General Assembly, held on 13 September, was attended by 124 representatives from 68 member organizations. Kazunori Tanaka, Senior Vice Minister of the Environment, Japan, and Issei Nishikawa, Governor of Fukui Prefecture, delivered opening remarks. A Public Forum was held in the afternoon of the 13th and morning of the 14th under the theme “Challenges and Opportunities for Socio-Ecological Production Landscapes and Seascapes (SEPLS) from Local Perspectives”. A total of 142 persons attended the forum, which was co-chaired by Yoko Watanabe, Program Manager and Senior Biodiversity Specialist, Secretariat of the Global Environmental Facility, and Dr. Wanja Nyingi, Coordinator of the Kenya Wetlands Biodiversity Research Group. At a plenary session at the beginning of the forum, Kazuaki Hoshino (Director-General, Nature Conservation Bureau, Ministry of the Environment, Japan) delivered opening remarks and Hiroaki Sekioka (Environmental Assessment Center, Co. Ltd), gave a presentation on local experiences and lessons from satoyama/satoumi in Fukui. Five IPSI members then gave presentations on their innovative activities and shared local experiences and lessons in managing SEPLS. Following the presentations, the meeting broke into discussion groups. The outcomes of the group discussions were presented on the second day of the Public Forum by representatives of each group. Drawing on the presentations and the discussions, participants then developed a shared understanding on several items. At the closing of the Public Forum, Kazu Takemoto, Director of the IPSI Secretariat, stated that the outcome would be very useful for implementation of the IPSI Strategy, and would be reflected in planning the roadmap to prepare for the next global conference. More practical discussions will be encouraged, he said, at the local level through the organization of regional workshops. Touching upon the endorsement of the Plan of Action, he said that IPSI has entered into an implementation stage and requested that participants take home what they learned at the conference and apply it to their own activities. A poster session on 13–14 September featured 44 posters in the IPSI category (English) and 53 in the Fukui category (Japanese). In the evening of 13 September, a Satoyama Dialogue was held with Governor Masanori Tanimoto (Ishikawa Prefecture) and Governor Issei Nishikawa (Fukui Prefecture), both prominent political leaders in regards to satoyama and satoumi in Japan. The dialogue was moderated by Prof. Kazuhiko Takeuchi, UNU Senior Vice-Rector. For more information, see 4th IPSI Global Conference Held in Fukui report on the UNU-IAS website.